Over twitter, James Boo (of The Eaten Path) asked where he could find 82% butter near Union Square. I sent him to East Village Cheese Shop 40 Third Avenue, New York, NY 10003, and that’s it, we were friends. He found the butter he needed, and that’s all it takes to become friends with a food blogger. We’re an easy bunch. We decided to meet for lunch, and this time he got to return the favor by sharing one of his favorite bowls of ramen with me, the Shio: Salt and Roasted Garlic Ramen at Minca 536 East 5th Street, New York, NY 10009. With my developing sniffles, this was the perfect lunch. The broth is richly flavored, though not quite as heavy as the Ippudo broth (which I love). The toasty aroma of the roasted garlic really stands out, even with a plugged up nose. I could inhale the heavenly fumes for hours. The generous slices of pork are tender and break apart with a gentle tug. The seaweed and bamboo add the fun snaps and and crunches, while the thin ramen with squared edges offer just the right resistance in each bite. The half red cooked egg is a little saltier than most, a wise way to make one that will sit in a soup (as some flavors will wash away). It was a wonderful bowl for $9.50, one I will certainly have again. My one little wish is for a little extra broth since there’s so much stuff in there. I’m not complaining; I’m really not! Thanks James! Hope to see you again soon. posted by jessica	at 05:09 PM	Filed under Asian, Favorites, Restaurants. You can follow any responses to this entry through the RSS 2.0 feed. Both comments and pings are currently closed. I’m always looking for new ramen houses. This place looks fab! I really like the meat and noodles in Minca’s ra-men. I like my soup to be more salty (I REALLY like shio ra-men) and found them to be very accommodating – they’ll give a side of the salt base that they add to the soup. There’s also a sister store (Kambi) on 14th Street and 1st Ave.
Minca is my favorite ramen house in NYC. try the toroniku ramen (#15 i think?). the sister store on 14th st isn’t as good as the alphabet city location. 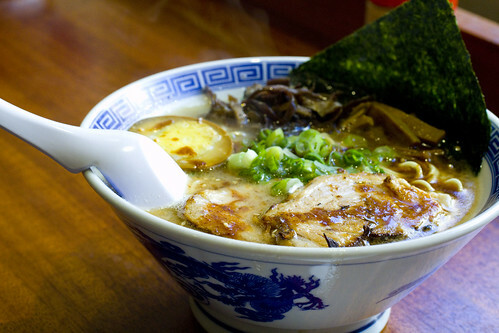 How does it compare to Ramen Setagaya, which is sort of the control group in that area? Morley, sorry for the delayed response. I’ve been running around town with my guest from Japan. I like Minca more than Ramen Setagaya, which is good for it’s price, with a nice broth, but the meat can be dry despite the surrounding fat.